Disconnect the negative (–) terminal cable from the battery, and wait at least for 90 seconds. 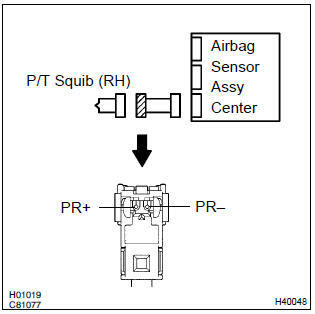 disconnect the connectors between the airbag sensor assy center and the seat belt pretensioner (rh). 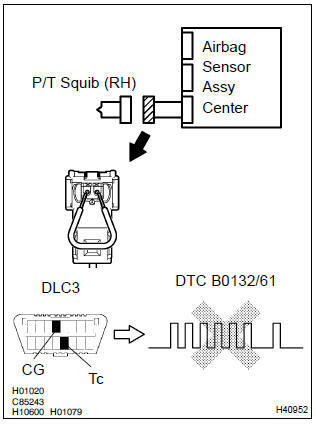 for the connector (on the seat belt pretensioner side) between the airbag sensor assy center and the seat belt pretensioner (rh), measure the resistance between pr+ and body ground. 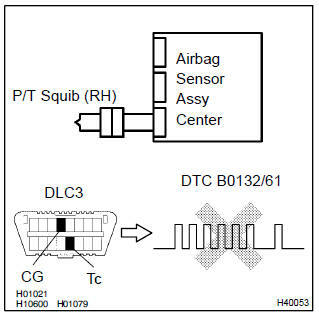 Connect the connector to the airbag sensor assy center. using a service wire, connect pr+ and pr– of the connector (on the seat belt pretensioner side) between the airbag sensor assy center and the seat belt pretensioner (rh). connect the negative (–) terminal cable to the battery, and wait at least for 2 seconds. turn the ignition switch to on, and wait at least for 20 seconds. clear the dtc stored in memory . turn the ignition switch to lock, and wait at least for 20 seconds. Ok: dtc b0132/61 is not output. : codes other than code b0132/61 may be output at this time, but they are not relevant to this check. connect the seat belt pretensioner (rh) connector.